Tommy Chong makes a blunted cameo in the video for the title track of Slightly Stoopid's latest album, "Top of the World." 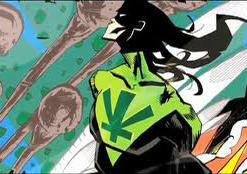 The ganja-smoking comic-book hero, "Marijuanaman," created by Ziggy Marley, now has a theme song. "He's gonna save the land," Marley sings, "with a plant in his hand."